Matthew Grymek/AMC Photo ContestWondering when to turn around while hiking? Don’t be a hero. Do practice good sense. 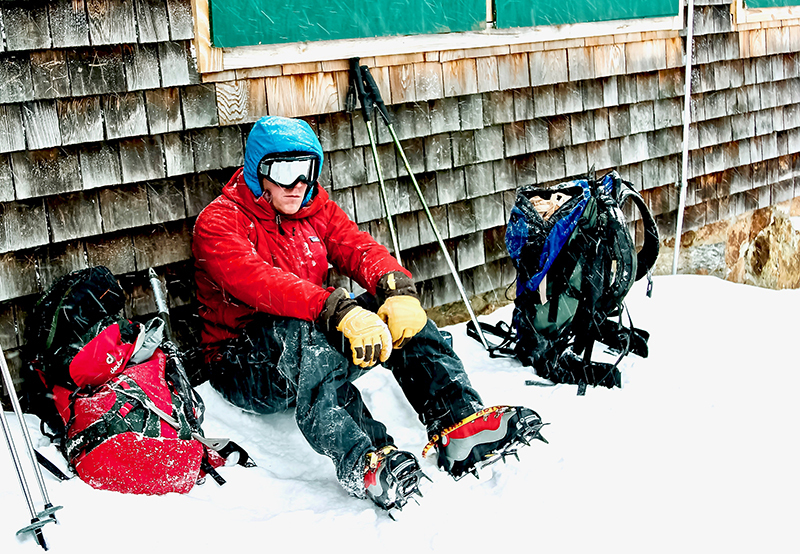 Getting home safely while winter hiking means knowing when to call it quits. The mountain, the trail, the journey: They’ll all still be there another day. A responsible hiker sets a turnaround time before hitting the trail, especially in winter, when daylight fades much earlier than other times of the year. But there are also conditions when you should turn back before your intended time. Emily Davenport, an AMC outdoor guide based at Pinkham Notch Visitor Center in New Hampshire, has seen her share of such situations and offers some tips on when it’s best to make that decision, especially in winter. We’ve all been outside, enjoying the day, only to have the blue sky eclipsed by dark, ominous clouds. This can be annoying on the trail in summer. In winter, it’s genuinely dangerous. She recalls one instance when she was on a snowshoe trip in the White Mountains that was interrupted by a snow squall. “Visibility became less and less, with snow accumulating quickly,” she says. “I soon realized that my tracks would be covered and that visibility would be lowered, and it would be harder to see trail markers, like blazes and cairns. I opted to turn around.” The moral: Even pros turn back when visibility decreases. This is an easy one. Or is it? Newbies know to pack it in when they turn an ankle or wrench a knee, but for more experienced hikers, a minor mishap might not be worth forfeiting the hike. But as Davenport points out, a minor injury can prove problematic in winter conditions. An unexpected dunk in an ice-covered stream would send anyone home. But what about when only your feet go through? “It’s almost impossible to fully rewarm, especially if you have soaking wet boots,” Davenport says. Weather and terrain can be dramatically different from the start to the end of a winter hike, placing real challenges on gear. You wouldn’t want to cross an ice field in hiking boots without traction, for example. You may be able to make it up an ice-covered slope, leaning in, but things change dramatically when gravity begins to push you downhill. Good preparation reduces your chances of needing to turn back. Read our expert’s advice on keeping your footing on ice. Hiking above treeline this winter? Here’s a gear checklist to stay safe and have fun.